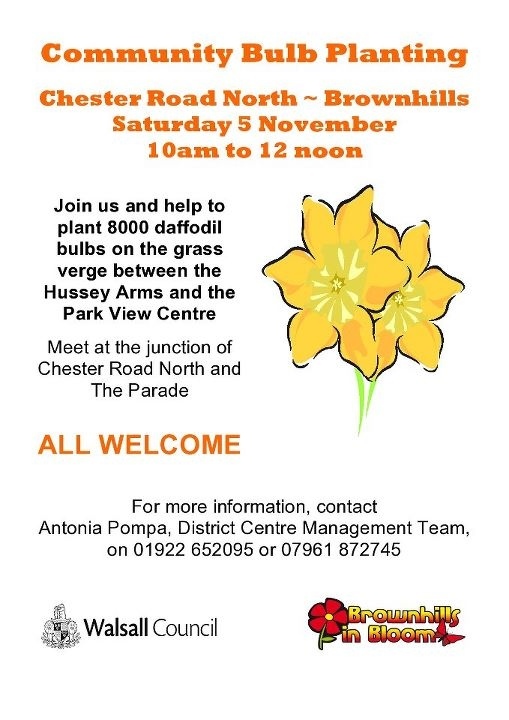 Local school children and community groups will be planting 8000 daffodil bulbs along the grass verge of Cheter Road North in ten days time. We need your help to finish the planting off on Saturday 5 November so please come along and help make Brownhills a sea of colour in springtime! This entry was posted in Brownhills stuff, Environment, Events, Fun stuff to see and do, Local media, News, Reader enquiries, Shared media, Social Media, Spotted whilst browsing the web, Walsall community, Walsall Council, Wildlife and tagged Brownhills, Daffodil panting, fun stuff, Things to do, Town Centre Partnership. Bookmark the permalink.